To do so, he dispels what he considers three key assumptions – so-called quasi-fallacies – underlying the wisdom of IP minimalism. Instead of simply resorting to a conclusory “property-rights-are-valuable” mode of critique, Barnett develops his compelling, economically grounded arguments using a variety of original case studies, data, and theoretical insights. Instead of attacking hypothetical strawmen, Barnett directly confronts the empirical claims of the minimalist camp. First, Barnett rebuts the common claim that, in the absence of IP, the market will generally price goods and services at a competitive cost (usually assumed to be marginal cost, but no higher than average cost). As Barnett properly contends, because markets often reorganize in the absence of IP to use other mechanisms to inflate price well beyond the competitive equilibrium, IP rights may actually reduce deadweight losses and lower entry barriers relative to alternatives. This is especially so in disaggregated industries, such as biotech and consumer electronics, that rely upon IP rights to reduce transaction costs in contracting. Barnett’s quintessential example is Linux, which is often trumpeted in IP scholarship as a paradigmatic example of innovation without IP. Linux is nominally free (at least many versions of it) and thus priced at marginal cost. Indeed, given its “open source” and “free” nature, many scholars argue that strong IP rights (patent and copyright) reduce social welfare by thwarting the development of Linux and similarly “free” and “open” technologies. However, as Barnett ably explains, Linux is largely funded and developed by for-profit entities to sell other products and services at arguably supracompetitive prices. Specifically, because Linux is free, this diminishes direct competition from firms that earn revenue solely from producing and selling operating systems. This diminished competition, in turn, very likely results in supracompetitive prices for complementary products and services. Although the presence of robust IP rights may make Linux itself more costly, these rights may actually spur competition from startups and other entrants in the operating system software market, improving overall prices for the entire package of products and services needed by consumers. Linux is not an isolated example, as many instances of putatively “free” innovation are financially driven, including by IP rights. This recognition leads to Barnett’s second “quasi fallacy,” that a substantial amount of innovation can occur in the absence of IP rights or at least some market substitute for IP rights, like complementary assets (e.g., marketing muscle, capital reserves, network effects, and the like), noncompete agreements, trade secrecy, and the like. Certainly, there is a non-trivial amount of self-motivated, “altruistic” innovation and creativity, and other non-market-based innovative activity that is spurred without barriers to entry, and Barnett does not doubt as much. And, within this sphere, IP rights are often pernicious. Rather, Barnett’s legitimate concern is over the extent of these non-market phenomena, especially as they relate to the commercialization of intellectual goods. For example, although it is now relatively straightforward to record a song or code a mobile phone app in one’s bedroom, IP rights can play an essential role in the production, marketing, and distribution of innovative and creative works from songs to apps to vaccines. Barnett again provides a series of case studies and leverages a variety of data that – while certainly not definitive – highlights the need for more systematic research on the extent of innovation that has been driven without IP rights (or some market-substitute for IP rights). As to the former claim, although the IP system could help startups more, there are many tangible benefits of IP rights to startups, especially in terms of garnering investment. Whether these benefits outweigh the costs is an open question, but there is no solid evidence that on balance, IP rights hurt startups or small companies. As to the latter claim, similarly, there are no sound studies showing that NPEs are a major problem for innovation. Although there are certainly some “bottom feeder” NPEs that assert frivolous claims inside and outside of litigation, there is no reliable evidence showing that they account for more than a small share of NPE activity and related costs. Indeed, controlling for a variety of patent- and district-related characteristics, the most reliable studies show that litigated NPE patents appear to be very similar in quality to litigated operating company patents. “In fact,” I note, “in many cases, the advertiser appears in the first (paid) ad link and immediately below it in the first generic (unpaid) link. For instance, type ‘Nike’ into Google. ‘Shop Nike.com’ appears first as an ad link followed by ‘Nike, Inc.’ as a generic link” (see below). By applying Barnett’s analysis, we can explain this conundrum, and – more importantly – its economic implications. Specifically, Nike, like many other advertisers on Google, purchases paid links for at least three reasons. 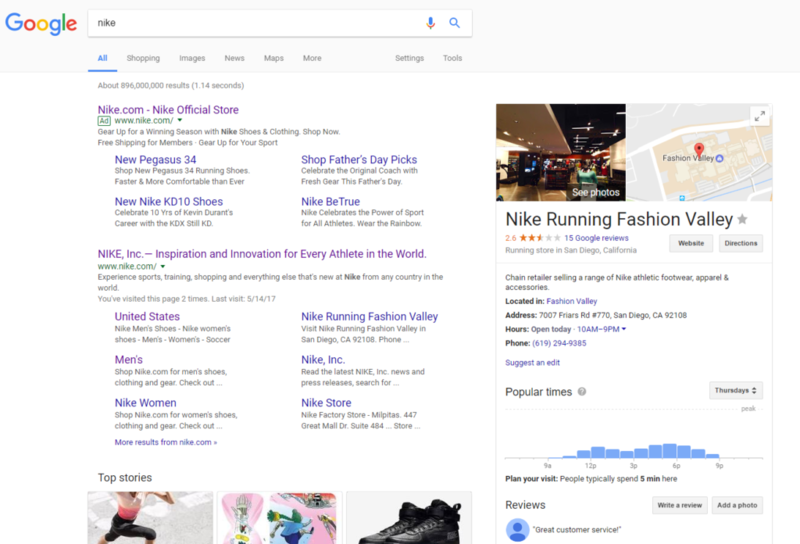 First, to crowd out other search results from appearing towards the top of the list, Nike can divert more users to its website. Second, presumably Google privileges its advertisers in its generic search results—even if indirectly via increased traffic from when users click on Google’s paid ad links. Last, paid links can help identify consumers who click those links and provide customized online experiences (including pricing) to those consumers. In sum, Google, by relying on its “free price” and massively complementary assets probably reduces competition not only for search but also for online advertising, especially in the face of weak IP rights that – like Linux – may very well make its search service nominally cheaper on the front-end, but much more expensive on the back-end. The moral of this story is simple and returns us to Barnett’s salient theme—even in the absence of traditional intellectual property rights (patent, copyright, and trademark), markets will often dynamically reorganize to squeeze as much profit out of their innovative products and services as possible, all the while diminishing innovation incentives. Whether this reorganization is better or worse for society than a world of robust IP rights is a thorny empirical question, but one that should be at the forefront of IP scholarship. Cite as: Ted Sichelman, Sometimes, Information Wants to be Expensive, JOTWELL (June 26, 2017) (reviewing Jonathan M. Barnett, Three Quasi-Fallacies in the Conventional Understanding of Intellectual Property, 12 J.L. Econ. & Pol’y 1 (2016), available at SSRN), https://ip.jotwell.com/sometimes-information-wants-to-be-expensive/.